Use Lync Web App to join a Lync Meeting from your browser if you don’t have Lync 2013 or Lync Basic 2013. Lync Web App will launch automatically when you click the Join Lync Meeting link in the meeting invitation. You can use your computer’s mouse and speakers or a headset to connect to the audio portion of the meeting. If your computer doesn’t have any audio devices connected to it, you can connect to the audio portion of the meeting from your phone instead. Choose what’s best for you. In your meeting invitation, click Join Lync Meeting. Type your name in the text box to sign in as a guest, or click Sign in if you are an Office 365 user to sign into Office 365. Make sure to select the option to install the Lync Web App plug-in. In the dialog box that displays a choice to run or save the plug-in file, click Run, and follow the prompts to install the plug-in. Depending on the meeting options set by the meeting organizer, you’ll either enter the meeting right away or wait in the meeting lobby until admitted. Tip: When you sign in to a meeting from Lync Web App, you can select the Remember me check box to save your sign-in information and speed up your entry into future meetings. You can also select this option after you join a meeting by going to >Options>General, and selecting the Remember me on this computer check box. 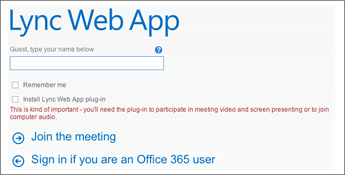 Important: The options to join the meeting from your phone are not available if you or another Lync for Office 365 operated by 21Vianet user set up the meeting. This might be true in other cases as well, depending on the meeting organizer’s account configuration. Your workplace technical support might have more details. Clear the option to install the Lync Web App plug-in. In the Join Meeting Audio dialog box, click Have the meeting call me to enter a phone number where the conference can call you. Or, if the meeting request includes call-in details, click I will dial in to the meeting and call one of the phone numbers listed in the request.